It's not hard to find children's stories with good morals. The great majority, in fact, are quite moral, demonstrating that loyalty, helpfulness, thriftiness, persistence, tolerance or some other positive character trait is rewarded in the end. I am not opposed to good morals in children's picture books. On the other hand, I'm not especially excited by them either. Much more exciting are children's books that help children grasp the idea of grace--or, rather, grasp at the idea of grace. 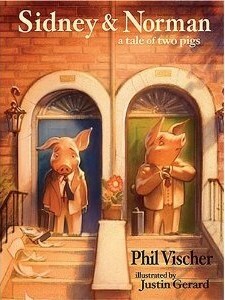 A favorite in our house is Phil Vischer's book, Sidney & Norman: A Tale of Two Pigs. The book is illustrated by the brilliant Justin Gerard of Portland Studios in Greenville, SC. Sidney and Norman are next-door neighbors, though they don't really know each other. Sidney is an unusually messy pig. He can't seem to get it together. He's perpetually late; he can't keep his tie straight. He lives in a state of constant shame. Norman, on the other hand, has always had it together. He always follows the rules and has enjoyed the kind of success in his life that makes him believe he must be doing something right. On the same day both Sidney and Norman receive invitations to meet with God. Sidney is terrified. He thinks back to the times he was called into the principal's office and he shudders. Norman, on the other hand, is thrilled. He assumes he must be getting some award. I won't give away the ending, but I will say that it is beautiful and that I've never seen a better picture of God's grace in a picture book. Sidney and Norman strikes a blow against self-righteousness in a way that a merely moral book never can. Phil Vischer, by the way is the creator of Veggie Tales. This book has been around since 2006. I wish more families knew about it. What are some other children's books that depict grace?